Ender The Cat Knows How To Use The Toilet. Unfortunately, He's A Bad Marksman. Cats can definitely be taught or learn on themselves to perform acts that are attributed only to humans. Like using the toilet bowl when pooping. 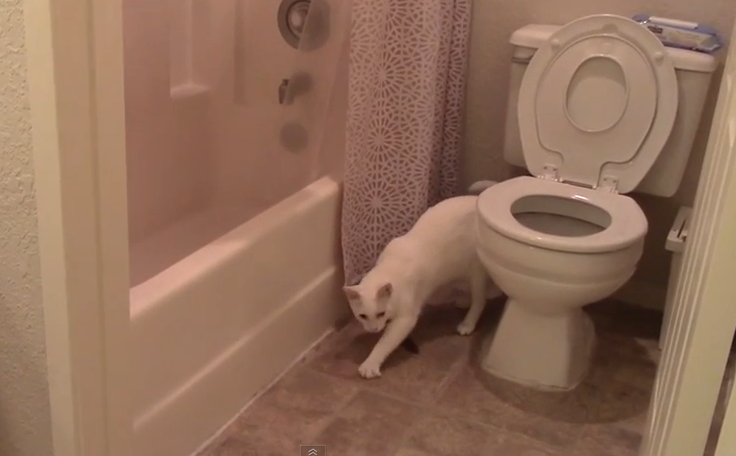 YouTube user Wellfalcon was recording on video her cat Ender when she caught the white cat trying to poop on the toilet bowl the way humans do. Standing on the rim of the bowl with his hind legs while his front legs are pushed up against a nearby wall, Ender can be seen doing his business. Unfortunately, it was bad business as his refuse ended up landing not on the bowl but on the bathroom floor. His owner screamed in disbelief and rightly so. Even Ender seemed to have been surprised by his bad marksmanship. He tried to cover up what he did but with no success. Moral of the video? Get your cat a litter box. Don't think of training it to poop like you do. Besides, cats being cats, they might not bother flushing their business down. Still, it's quite amazing to see a cat attempt something like this. Ask any cat owner, it's almost next to impossible to teach a cat to do a trick. To train it to poop like a human being is simply amazing.